Apple Maggot Fly AMF -- Rough guess of peak AM trap captures is: August 2, Wednesday. Dogwood borer DB -- First egg hatch roughly: June 22. Peak hatch roughly: July 26. Codling moth CM -- 2nd generation 7% CM egg hatch: July 28, Friday, = target date for first spray where multiple sprays needed to control 2nd generation CM. 2nd generation 30% CM egg hatch: August 7, Monday, = target date where one spray needed to control 2nd generation CM. Oriental Fruit Moth OFM -- 2nd generation - first treatment date, if needed: July 3, Monday. 2nd generation - second treatment date, if needed: July 15, Saturday. Spotted Tentiform Leafminer STLM -- 2nd STLM flight begins around: June 14, Wednesday. Rough guess of when 2nd generation sap-feeding mines begin showing: July 2, Sunday. Optimum first sample date for 2nd generation STLM sapfeeding mines is July 9, Sunday. Second optimized sample date for 2nd generation STLM sapfeeding mines, if needed: July 15, Saturday. Third optimized sample date for 2nd generation STLM sapfeeding mines, if needed: July 26, Wednesday. 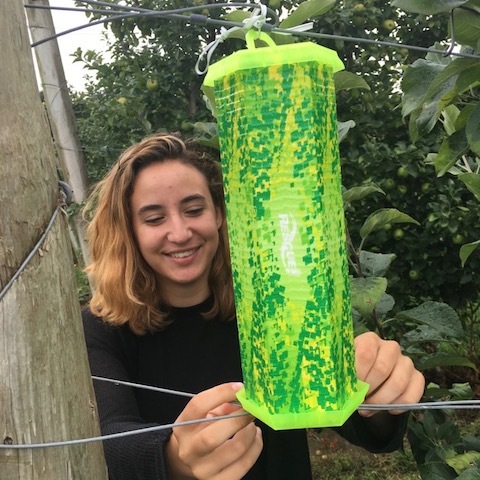 Today (Tuesday, July 25) I was out and about with Nicole Foley (iPiPE intern) checking our insect traps at five orchards in eastern MA. Here, with some picts, are a brief summary of what we saw. • Most pheromone trap catches -- Oriental fruit moth, codling moth, obliquebanded leafroller, dogwood borer, spotted tentiform leafminer -- were at zero or seriously declining. I expect an uptick in codling moth catch any day now, unless they have been completely controlled within and near the orchard. • To date, WE have not caught any brown marmorated stink bug in traps. 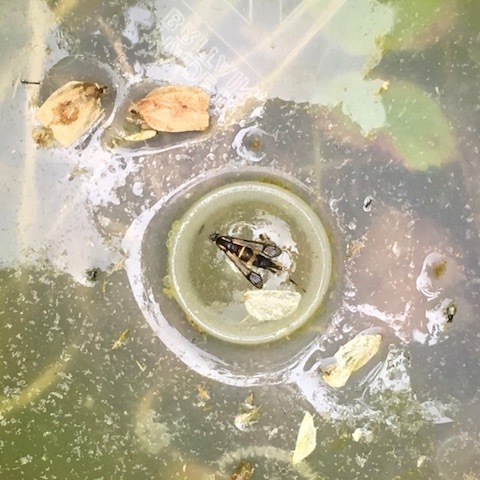 We deployed a new type of trap today (see pict) in several orchards after I saw an article indicating this had worked quite well to catch BMSB in Washington state last season. This is a "Rescue" wasp trap baited with BMSB pheromone. We'll see. • Although we already noted that pheromone trap catches are down or non-existent, the exception is Dogwood Borer (DB), which we are still catching and to be expected. (See AgRadar). Here, a male (presumably) DB (nice specimen) was caught in a Z-trap baited with obliquebanded leafroller (upper left) pheromone. 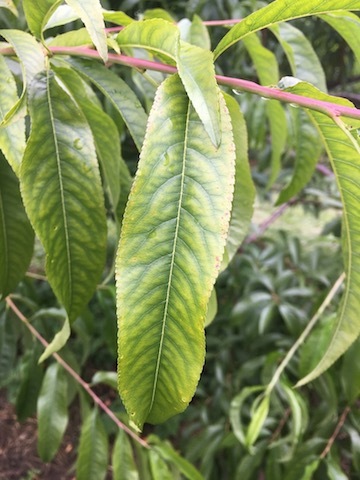 • Likely symptoms of magnesium deficiency were observed in a peach orchard. This I find to be fairly common, especially on light soils, and in a wet year. Grower is going to do a leaf analyis to confirm. Not sure how big a deal it is, but I would try to correct with soil applications of Sul-Po-Mag or K-Mag in the following season. Maybe foliar espsom salts (or formulated Mg product micro-nutrient spray) too? 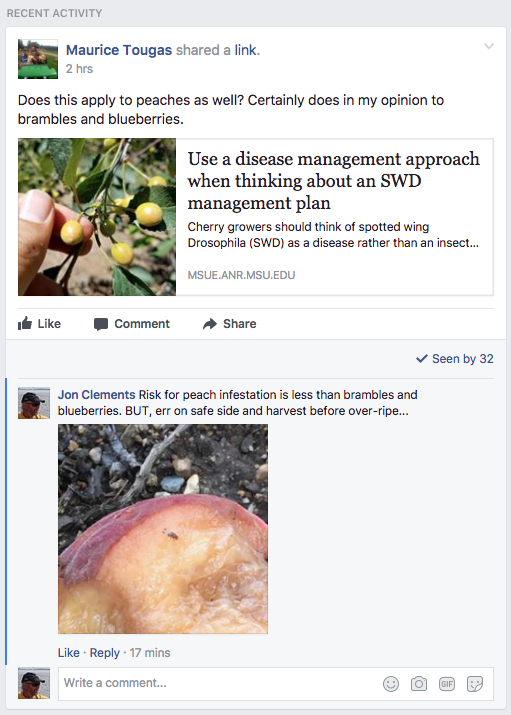 • I was asked today if Spotted Wing Drosophila (SWD) was an issue in peaches? My answer was, well, maybe, but keep up on harvest, don't let peaches get overly ripe on tree, practice sanitation (pick up drops) and spray insecticide if you can't keep up on above or have any doubts. 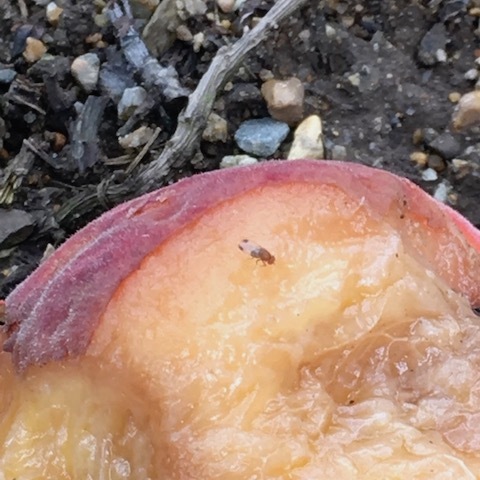 SWD will get in peaches (and nectarines, and plums), but like any other fruit fly, they take the easy route out and will definitely infest (and breed) in rotten or otherwise damaged fruit (see pict). This year SWD has appeared on the scene early and we've also seen good conditions for fruit fly infestation and population build-up. First time problem in cherries this year we have observed. I would not let your guard down unless you can pick every just barely tree ripe peach. Clean up the best you can, stay on top of harvest, and if in doubt, spray insecticides. See stone fruit insecticide recommendations for SWD. • See Dan Cooley's article below on phytophtora. 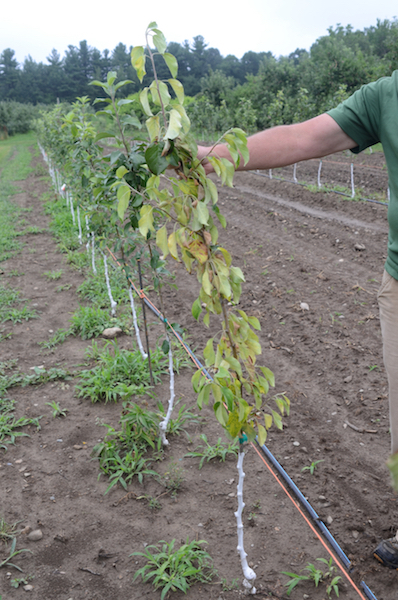 Some apple trees continue to show new signs of collapse/dying in the afflicted young planting. Dogwood borer has been on the wing for some time now and will continue to emerge, likely into early September. Rather than chasing after the eggs that may be deposited on trunks in bur knots and other damaged tissue with an insecticide, take a sweep through your orchard with the mower to knock back tall grasses, eliminating nice humid spots where DB like to hang out. Be sure all weeds are removed from the inside of wire mesh mouse guards as well. This may seem like a time consuming task, but so is replanting trees that DB has killed. I haven’t seen any apple maggot in traps yet, but today is a new day! No big surprise given the wet season that apple scab continues to show up. This year seems to have been especially tough for scab management. Must be payback for last year’s easy scab season. Flyspeck is beginning to show up. The first incidence was noticed yesterday. Seems a little odd not to have seen any sooner. No big rain in the immediate future, but it never hurts to keep your eye on the forecast! Phytophthora crown and root rot. 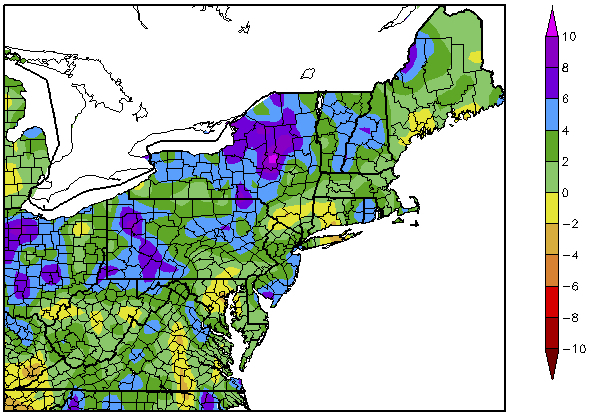 For several years, the rainfall in New England has been relatively normal to really, really low. Then we get this year, where rainfall for the past 90 days has been above normal in most of the region. 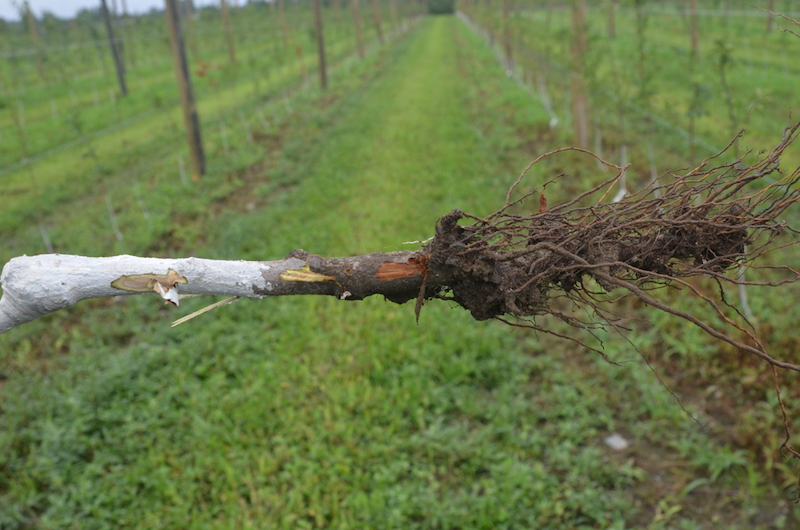 One of the impacts of a wet year on apple diseases is an increased risk of Phytophthora crown and root rot. 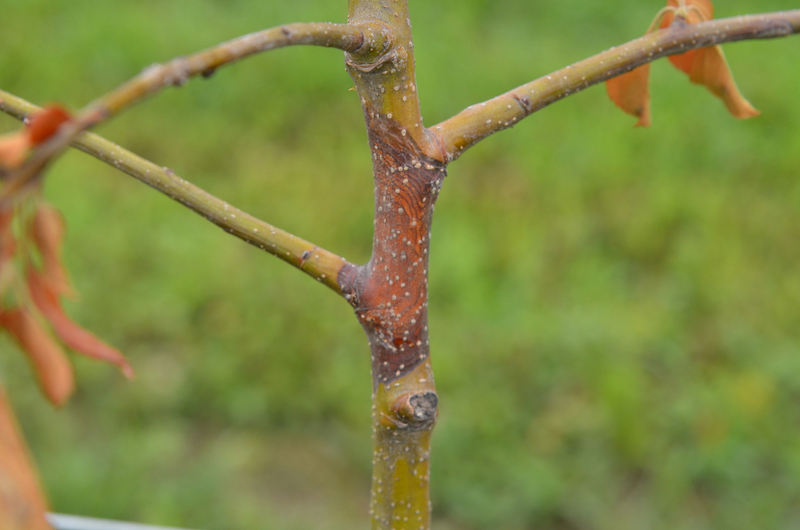 As the name suggests, this disease attacks apple rootstocks and above-ground around the graft union. It can stunt and kill trees. 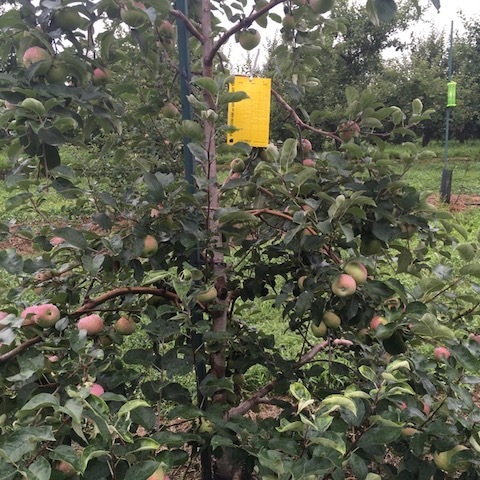 A couple of weeks ago, two orchards reported problems in trees planted this year. 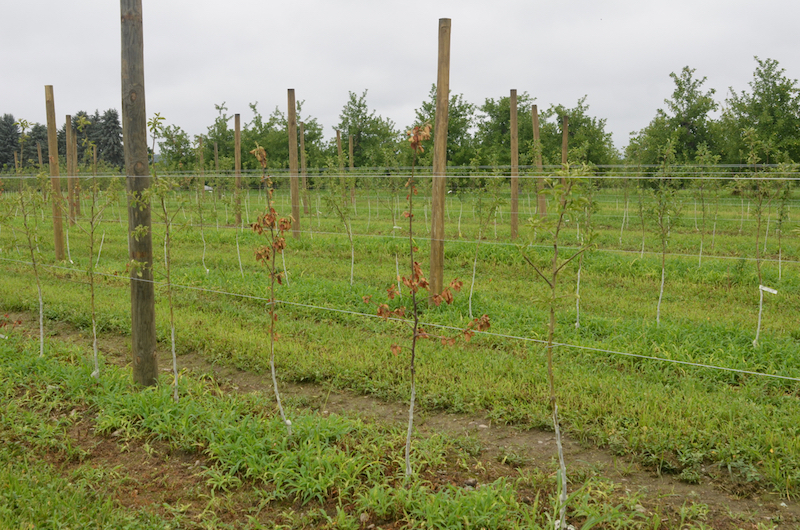 One orchard planted a few different cultivars, but a problem developed almost exclusively Evercrisp on Bud. 9, the other on Honeycrisp on Bud. 9. The growers described the problem as a rapid wilt and dieback of the trees, and were concerned that fire blight might be involved. One described brown, dead areas on the bark of the main stem. When sample trees were dug up, and bark removed, it was obvious that the roots were not healthy, and rot extended above ground, though green tissue could be seen higher up on the trunk. Phytophthora crown and root rot. Young trees that have been killed by Phytophthora crown and root rot. tree opens it to infection by weak pathogens such as Botryosphaeria obtusa which causes black rot. 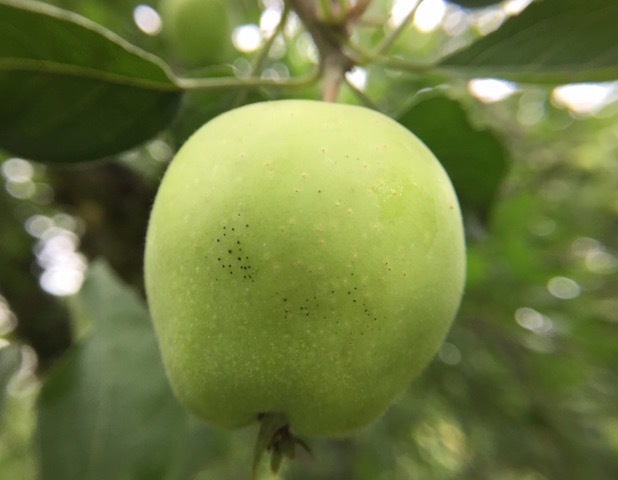 Over the phone, the nursery suggested that the disease was “aerial Phytophthora.” Phytophthora in apples is very seldom spread through the air, and is extremely rare in the Northeast. Root and crown rot is caused by Phytophthora that is in the soil or on the roots at planting. The fungus is stimulated to attack the roots when the ground is saturated with water, producing spores that can sense roots are near and swim towards them. Crown and root rot problems hit during a wet year, or on a wet site, and the combination of a wet year and wet site can be deadly. At the UMass plant diagnostic lab, the trees tested positive for Phytophthora using an immunoassay. Scraping the soil and outer rot away on the main root revealed a brick red color to the wood, another indication of Phytophthora. The lab also tested for fire blight, which proved negative. Based on the tests, the fact that one site was quite wet and had a history of Phytophthora in apples, the best diagnosis was Phytophthora crown and root rot. Complicating this, however, is the fact that Bud. 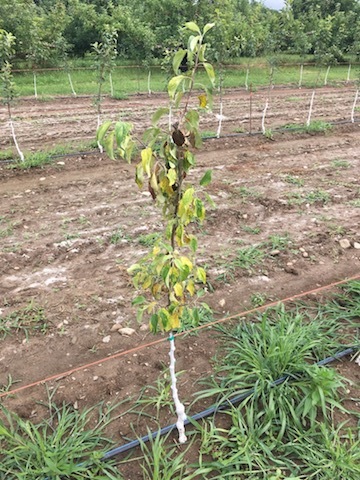 9 is supposed to be resistant to Phytophthora, however, as one of the world’s experts on Phytophthora of fruit trees, Wayne Wilcox, pointed out, resistance is not immunity. Resistance means a plant is less likely to get a disease like crown and root rot, but not that it never gets it. 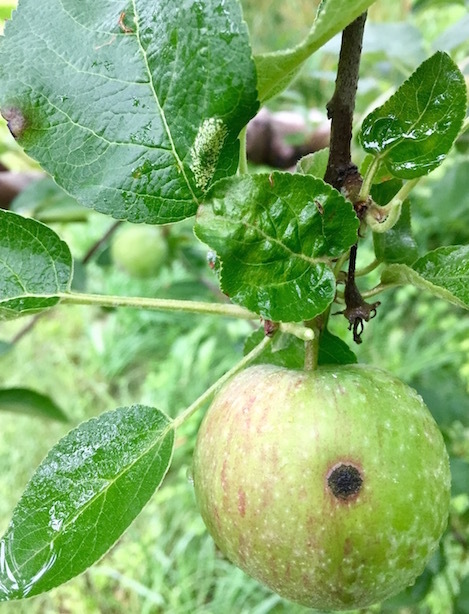 With enough “pressure”, such as a wet spring, transplant stress, plenty of Phytophthora, and heavy soils, apples can still get the disease. Dave Rosenberger and Wayne described situations where large percentages of MM.111, another resistant rootstock, were infected in New York orchards. In addition, the stem rotting high in many trees was strange. Probably this is caused by a different disease, such as black rot, that normally wouldn’t be a problem, but is taking advantage of the Phytophthora-stressed tree. Like most diseases, preventing Phytophthora saves a lot of time and expense trying to cure an outbreak. On heavy soils or sites with poor drainage, planting on a berm can be a real benefit. Raising the soil in the tree row only 6 to 8 inches, 3 to 4 feet wide, gets the bulk of roots on young trees out of standing water. Phytophthora needs standing water to produce the swimming spores that infect the roots. Similarly, tiling and drainage will also help. Trees that are showing foliar symptoms generally are not worth trying to save. At best, they will grow and produce poorly, and many succumb to the disease sooner or later. The money and time spent trying to nurse these trees is better spent replanting. Pull trees showing foliar symptoms, and treat replants with a root dip prior to planting, or a drench immediately after planting. For new trees and replacement trees, there are several chemicals registered for use against Phytophthora crown and root rot on apples. Ridomil Gold and MetaStar, the phosphite materials including Agri-Fos, Alliette, Fosphite, Oxiphos, Phostrol and Rampart, and fixed copper fungicides including Champ, Copper-Count-N, Cuprofix and Kocide 3000 are all registered. Ridomil Gold, MetaStar and the copper compounds are applied as soil drenches around the bases of trees at planting, or in spring before growth starts and after harvest in fall. The phosphite products are applied as foliar sprays or used as root dips before planting. A number of the phosphite products shouldn’t be applied within 1 to 3 weeks of a copper spray, as the combination may damage leaves. SHOULD begin collecting foliar nutrient analysis samples any time now and submitting to UMass Soil and Plant Nutrient Testing Laboratory (http://ag.umass.edu/services/soil-plant-nutrient-testing-laboratory/lab-services). Collect and submit by first week in August. No Guest article this week. The next Healthy Fruit will be published on Tuesday, August 8, or thereabouts, 2017. As always feel free to get in touch with any member of the UMass Fruit Team (http://extension.umass.edu/fruitadvisor/team-members) if you have questions or comments.